The Phuket Marine Office was informed by staff at Chalong Pier at about 11:40am that the tour speedboat Aphitada 1 was taking on water and had called for assistance, reports Thai-language newspaper Matichon. The boat had departed Chalong Pier earlier that morning with 45 people on board – 43 of them tourists on a tour around Maithon Island and Phi Phi Island, said the report. 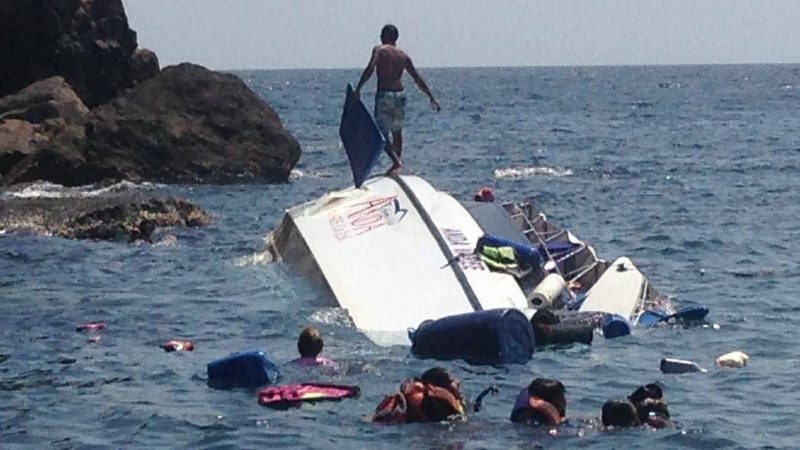 The boat was en route from Maithon Island to Phi Phi Island when it began taking on water. The captain pulled the boat close to Chalong Pier about 13 kilometres direct east of the tip of Cape Panwa. Another boat passing through the area soon arrived and safely recovered all 43 tourists and the two crew. The tourists were put on board another boat to continue their journey to Phi Phi Island, said the report. The company that operates the Aphitada 1 is located in Wichit, Phuket, added the Matichon report, but failed to identify which company. Conditions on the bay yesterday were mild, with light breezes and some strong gusts, but waves not reaching more than one metre in height. What caused the leaky tour speedboat to take on water is now being investigated, the report added. Attempts by The Phuket News to contact the relevant officials for more details have yet to be successful.